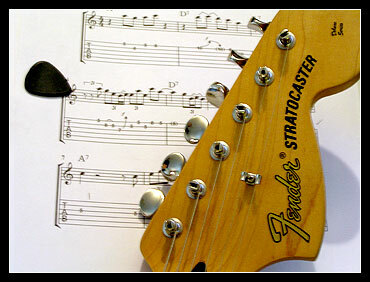 Wondering how to read guitar tabs and make sense of what you are seeing? First of all why guitar tabs for beginners? Well, there must be a good reason beginners should learn how to read guitar tab, but it took me quite a while to understand. 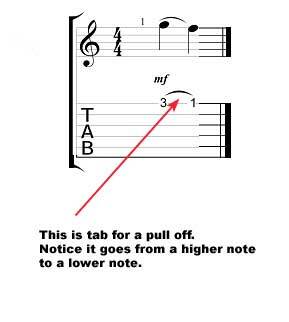 One good reason is that regular music notation takes a ton of effort, struggle, toil and frustration to master. Most beginning guitarists just want to make music as quickly as possible. Chances are you are thinking that way too. So somewhere in prehistory, way back when somebody came up with guitar tablature. Ok first thing, this website is about how to get an edge on the competition while learning guitar. 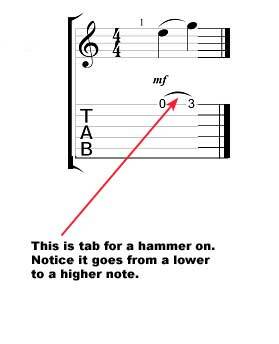 The same goes with reading guitar tabs. 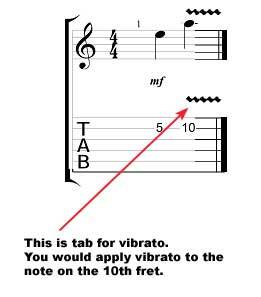 I'm gonna give you what I have learned about guitar tabs and actually understanding what it is that it is trying to say. Guitar tab is somewhat like a paint by numbers system. You look at the tab and put your fingers where it says to put them. Sounds easy enough Right? In theory. 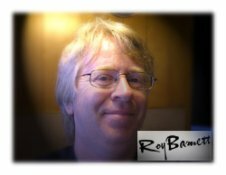 What the challenge is, is to make it sound like the music you are trying to make. Timing, rhythm, attitude is not included. 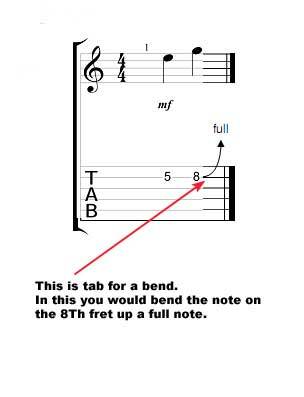 Here's the secret to how to read tabs. 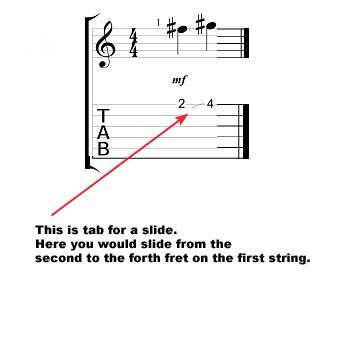 First of all - in order to make a tab sound anything like what it should sound like you should have an exact imprint of that song, lick or riff in your mind. This is accomplished by listening to the original piece over and over so that your whole body and mind has picked the groove of the piece you want to play. I'm serious, listen to the piece over and over through a good playback system until you know you've got it. Next step: This one requires software. I use a slow down program. A program - and there are just a couple out there to slow down the music and even cut out parts for you so you can learn them a bite-size bit at a time. Slow them down up to 50% or more, learn it and then raise the speed up a little at a time till you can play it consistently at full speed. This is the way to do it. This is a tool that can give you the advantage that I mentioned earlier. OK, since this is really like learning to read a whole different language you start with the basics and progress onto harder things as you go along. 1. 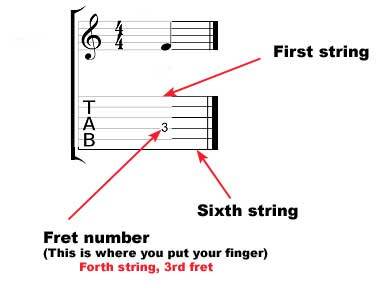 Guitar tab staff - Strings and fret numbers. The top is at the bottom of this one. Your thinnest string is pictured on the top so when you place your hand in position on the guitar neck, your fingers wrap around the guitar neck at the first string so your fingers will be right in place to follow along with the tab. 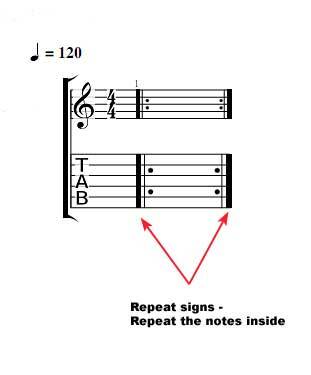 2.Repeat signs - in guitar notation repeat signs are there to let you know that you repeat that section of notes. How many times depends on the song. 3. Hammer-ons - one of the standards in guitar technique is the hammer on. 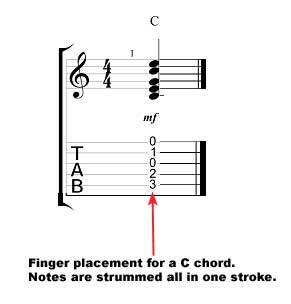 It means that the next note or notes up the guitar neck ate sounded by hitting it with the end of your finger sharply. 4. pull offs. The pull off is another standard guitar technique that is accomplished by pulling the finger on the upper note down in a plucking motion with the fretting hand while the lower note is fretted by another finger. 5. Slides - These sound really cool if done right. A slide is simply sliding your finger from one fret to another after plucking the string. 7. 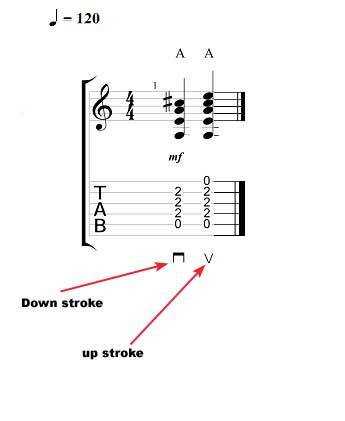 Picking directions - either up or down strumming or picking of the individual notes or chords. Work at being good at picking or strumming in both directions to make your music to flow. 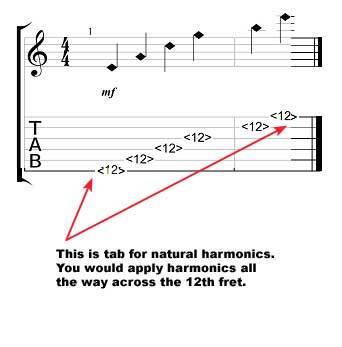 8.Harmonics - In this case Natural harmonics can add harp-like tones to your music. 9. Bends - Used in Rock, Country and Blues mostly, Bends add attitude to your music in a good way. 10. Vibrato - Another guitar technique for adding great sounds to your music. It is a wiggling of the string up and down to vary the pitch up and down. I hope you enjoyed this page on how to read tabs. Be patient with yourself and keep at it. It will pay off. Be sure to check out the following related page on this website. Great place to get started with guitar tabs or just guitar, in general. Satisfying results are fast with these. Return home from read guitar tabs.